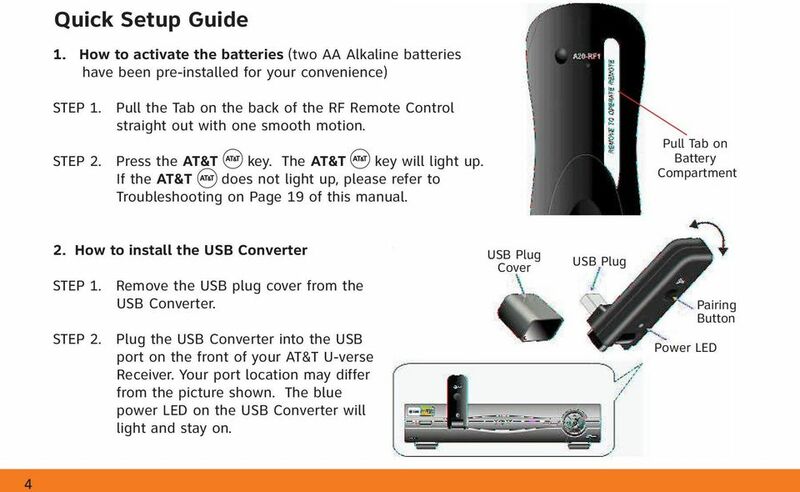 Download "Table of Contents Function Keys of Your RF Remote Control Quick Setup Guide Advanced Features Setup Troubleshooting"
2 Congratulations on your purchase of the AT&T U-verse TV Point Anywhere RF Remote Control. This product has been designed to provide many unique and convenient features to enhance your AT&T U-verse experience. Your new remote control, along with the USB converter, provides you with the flexibility of no longer having to "point" your remote control at the U-verse Receiver in order to change channels or access any of the receiver features. Since this is a Universal Remote Control, you have the ability to program up to three additional devices, such as a TV or DVD player. Another key benefit of your new Remote is its ability to "learn" commands from the remote controls for your other devices. You no longer have to worry about finding the right codes or that your TV will not be able to work with your new Remote Control. 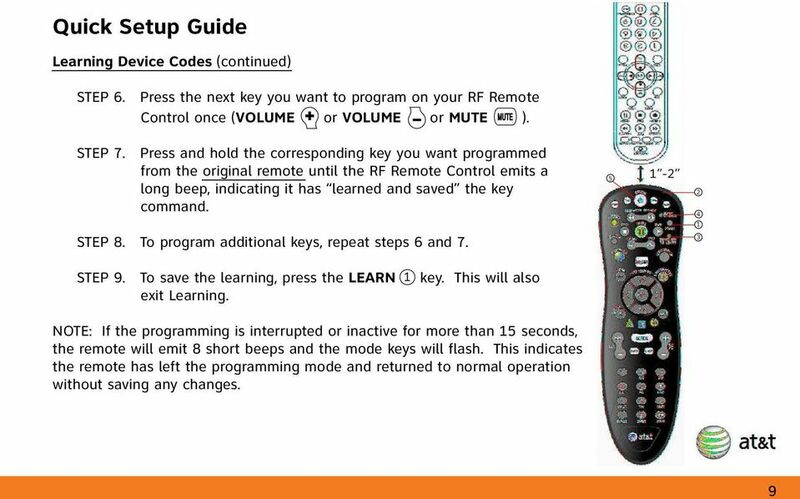 As long as you have the original remote that came with your TV or other devices, you can now program those keys into your new AT&T U-verse RF Remote Control. 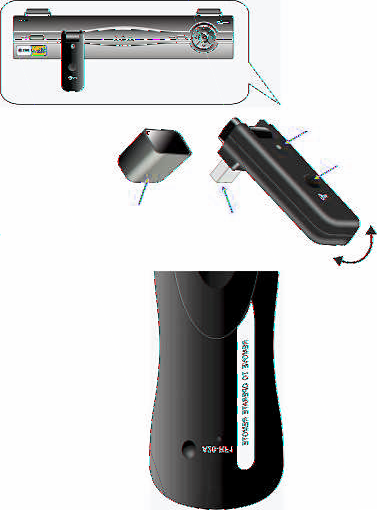 Additional features for this Remote Control are described in the remainder of this manual. Note: The RF Remote Control only controls the AT&T U-verse Receiver with the USB Converter using RF (radio frequency) signals. All other devices are controlled with IR (Infrared) signals. 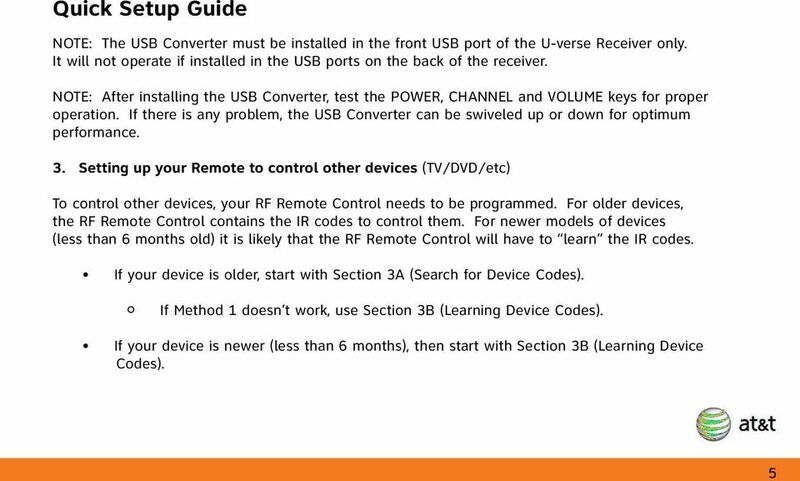 6 Quick Setup Guide NOTE: The USB Converter must be installed in the front USB port of the U-verse Receiver only. It will not operate if installed in the USB ports on the back of the receiver. NOTE: After installing the USB Converter, test the POWER, CHANNEL and VOLUME keys for proper operation. If there is any problem, the USB Converter can be swiveled up or down for optimum performance. 3. Setting up your Remote to control other devices (TV/DVD/etc) To control other devices, your RF Remote Control needs to be programmed. 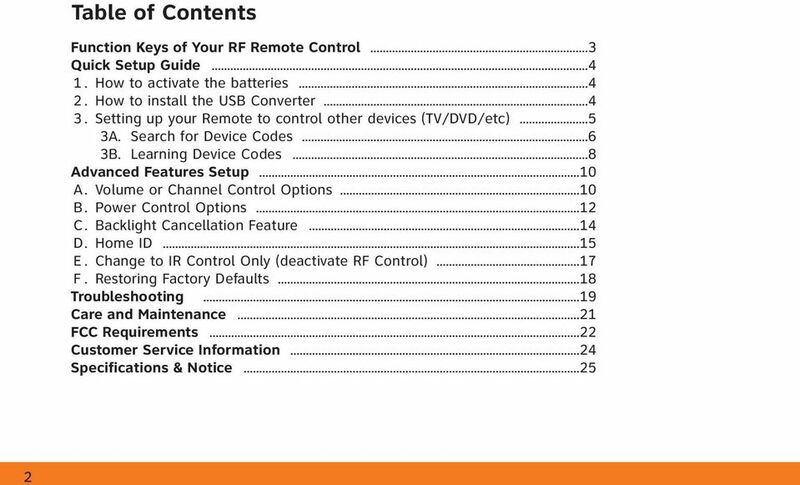 For older devices, the RF Remote Control contains the IR codes to control them. For newer models of devices (less than 6 months old) it is likely that the RF Remote Control will have to learn the IR codes. If your device is older, start with Section 3A (Search for Device Codes). If Method 1 doesn t work, use Section 3B (Learning Device Codes). If your device is newer (less than 6 months), then start with Section 3B (Learning Device Codes). 7 Quick Setup Guide 3A. 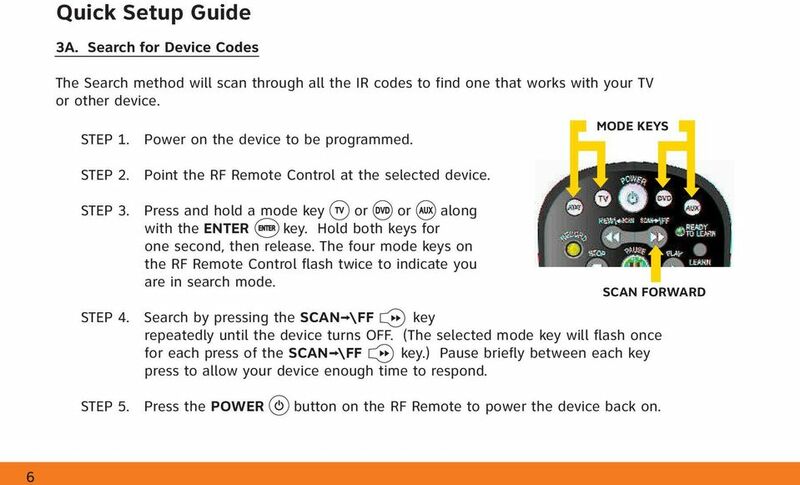 Search for Device Codes The Search method will scan through all the IR codes to find one that works with your TV or other device. STEP 1. Power on the device to be programmed. STEP 2. Point the RF Remote Control at the selected device. STEP 3. Press and hold a mode key or or along with the ENTER key. Hold both keys for one second, then release. 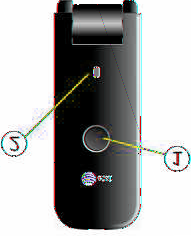 The four mode keys on the RF Remote Control flash twice to indicate you are in search mode. 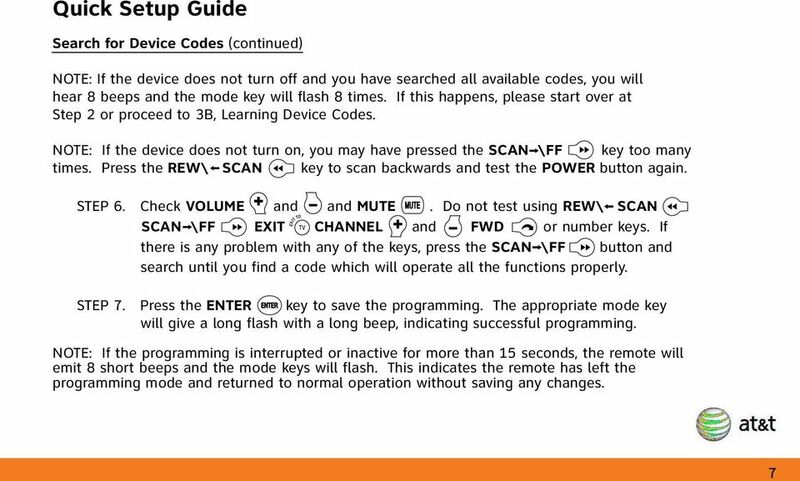 MODE KEYS SCAN FORWARD STEP 4. Search by pressing the SCAN \FF key repeatedly until the device turns OFF. (The selected mode key will flash once for each press of the SCAN \FF key.) Pause briefly between each key press to allow your device enough time to respond. STEP 5. Press the POWER button on the RF Remote to power the device back on. 8 Quick Setup Guide Search for Device Codes (continued) NOTE: If the device does not turn off and you have searched all available codes, you will hear 8 beeps and the mode key will flash 8 times. If this happens, please start over at Step 2 or proceed to 3B, Learning Device Codes. NOTE: If the device does not turn on, you may have pressed the SCAN \FF key too many times. Press the REW\ SCAN key to scan backwards and test the POWER button again. STEP 6. Check VOLUME and and MUTE. Do not test using REW\ SCAN SCAN \FF EXIT CHANNEL and FWD or number keys. If there is any problem with any of the keys, press the SCAN \FF button and search until you find a code which will operate all the functions properly. STEP 7. Press the ENTER key to save the programming. The appropriate mode key will give a long flash with a long beep, indicating successful programming. NOTE: If the programming is interrupted or inactive for more than 15 seconds, the remote will emit 8 short beeps and the mode keys will flash. This indicates the remote has left the programming mode and returned to normal operation without saving any changes. 11 Advanced Features Setup A. 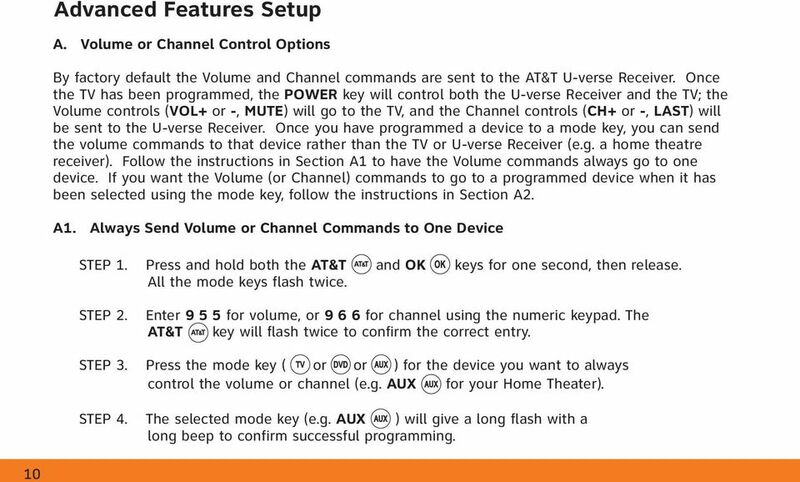 Volume or Channel Control Options By factory default the Volume and Channel commands are sent to the AT&T U-verse Receiver. Once the TV has been programmed, the POWER key will control both the U-verse Receiver and the TV; the Volume controls (VOL+ or -, MUTE) will go to the TV, and the Channel controls (CH+ or -, LAST) will be sent to the U-verse Receiver. Once you have programmed a device to a mode key, you can send the volume commands to that device rather than the TV or U-verse Receiver (e.g. a home theatre receiver). Follow the instructions in Section A1 to have the Volume commands always go to one device. If you want the Volume (or Channel) commands to go to a programmed device when it has been selected using the mode key, follow the instructions in Section A2. A1. Always Send Volume or Channel Commands to One Device STEP 1. Press and hold both the AT&T and OK keys for one second, then release. All the mode keys flash twice. STEP 2. Enter for volume, or for channel using the numeric keypad. The AT&T key will flash twice to confirm the correct entry. STEP 3. Press the mode key ( or or ) for the device you want to always control the volume or channel (e.g. AUX for your Home Theater). STEP 4. The selected mode key (e.g. AUX ) will give a long flash with a long beep to confirm successful programming. 12 Advanced Features Setup A2. Send Volume or Channel Commands only to the Device Mode Selected (e.g. 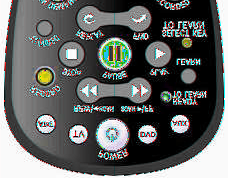 in DVD mode, the DVD player controls the audio, but in TV mode the TV controls the audio) STEP 1. Press and hold both the AT&T and OK keys for one second, then release. All the mode keys flash twice. STEP 2. Enter for Volume or for Channel using the numeric keypad. 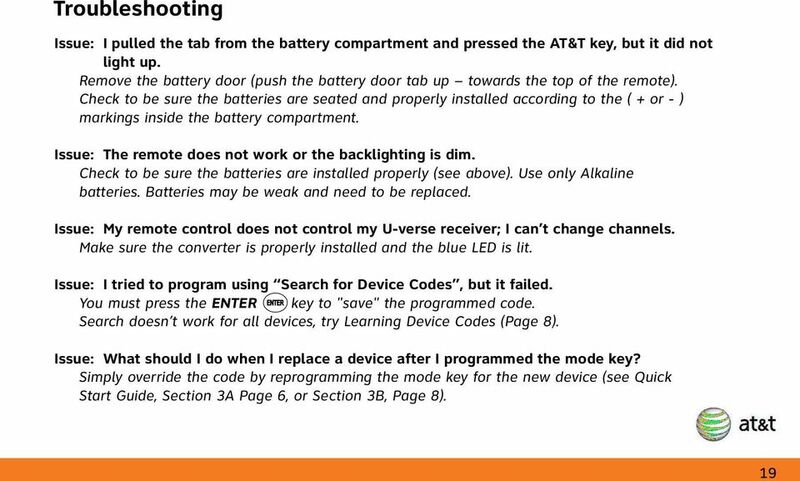 The AT&T key will flash twice to confirm the correct entry STEP 3. Press the ENTER key. The AT&T key will give a long flash with a long beep to confirm successful programming. NOTE: If the programming is interrupted or inactive for more than 15 seconds, the remote will emit 8 short beeps and the mode keys will flash. This indicates the remote has left the programming mode and returned to normal operation without saving any changes. NOTE: The mode key must first have been programmed for your device. 13 Advanced Features Setup B. 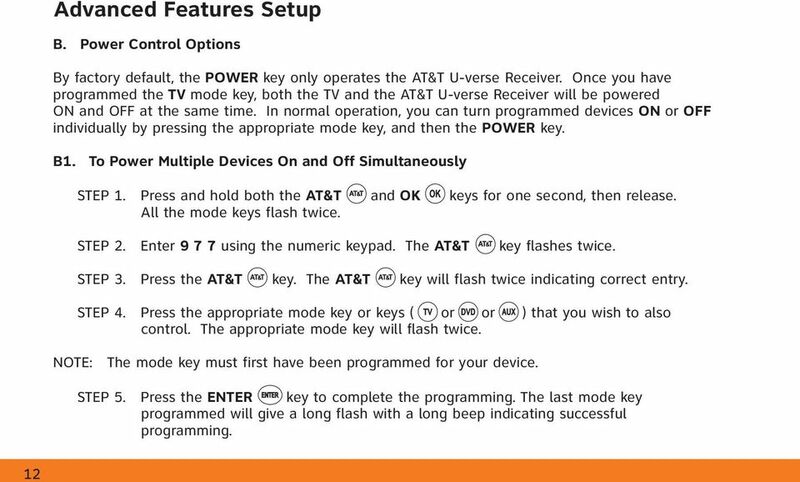 Power Control Options By factory default, the POWER key only operates the AT&T U-verse Receiver. Once you have programmed the TV mode key, both the TV and the AT&T U-verse Receiver will be powered ON and OFF at the same time. In normal operation, you can turn programmed devices ON or OFF individually by pressing the appropriate mode key, and then the POWER key. B1. To Power Multiple Devices On and Off Simultaneously STEP 1. Press and hold both the AT&T and OK keys for one second, then release. All the mode keys flash twice. STEP 2. Enter using the numeric keypad. The AT&T key flashes twice. STEP 3. Press the AT&T key. The AT&T key will flash twice indicating correct entry. STEP 4. Press the appropriate mode key or keys ( or or ) that you wish to also control. The appropriate mode key will flash twice. NOTE: The mode key must first have been programmed for your device. STEP 5. Press the ENTER key to complete the programming. The last mode key programmed will give a long flash with a long beep indicating successful programming. 14 Advanced Features Setup B2. To Power Devices On and Off Independently STEP 1. Press and hold both the AT&T and OK keys for one second, then release. All the mode keys flash twice. STEP 2. Enter using the numeric keypad. The AT&T key flashes twice. STEP 3. Press the ENTER key to complete the programming. 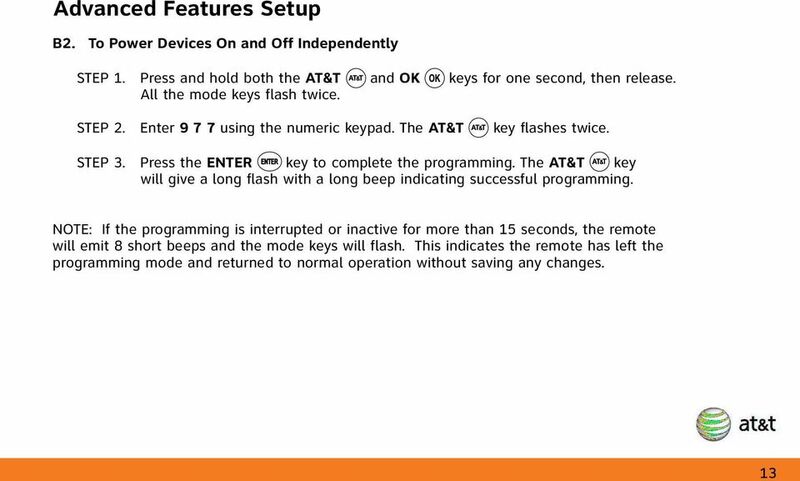 The AT&T key will give a long flash with a long beep indicating successful programming. NOTE: If the programming is interrupted or inactive for more than 15 seconds, the remote will emit 8 short beeps and the mode keys will flash. 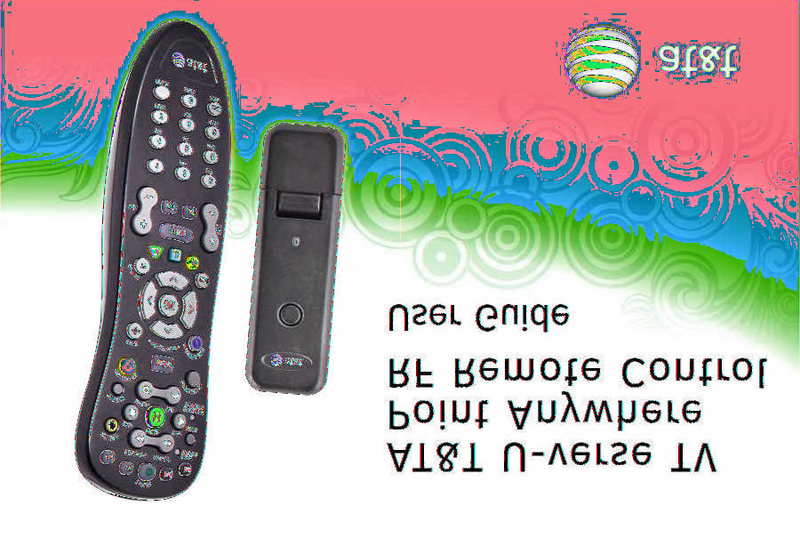 This indicates the remote has left the programming mode and returned to normal operation without saving any changes. 15 Advanced Features Setup C. Backlight Cancellation Feature Your RF Remote Control has the ability to turn the keypad backlighting ON or OFF. If you wish to use this feature to extend battery life, follow these instructions. C1. Turning the Keypad Backlighting OFF STEP 1. Press and hold the AT&T mode key together with the OK key for one second, then release. All the mode keys flash twice. STEP 2. Enter using the numeric keypad. 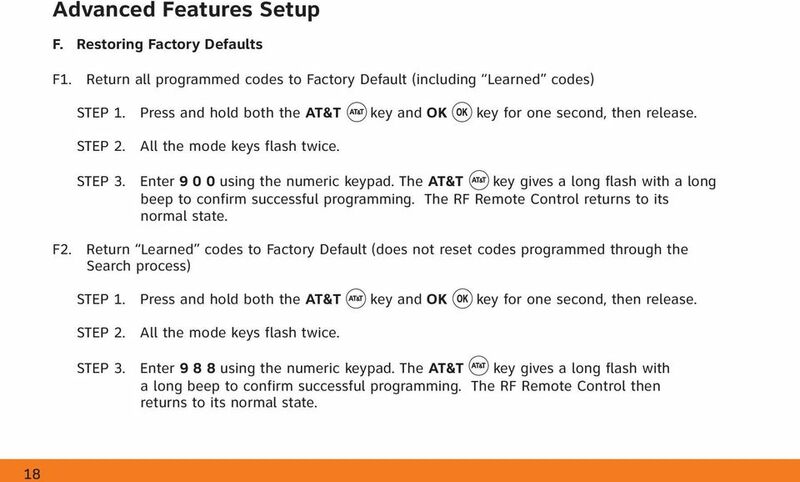 The AT&T key will give a long flash with a long beep to indicate successful programming. The RF Remote Control then returns to its normal state. NOTE: If the programming is interrupted or inactive for more than 15 seconds, the remote will emit 8 short beeps and the mode keys will flash. This indicates the remote has left the programming mode and returned to normal operation without saving any changes. C2. Turning the Keypad Backlighting ON STEP 1. Press and hold the AT&T mode key together with the OK key for one second, then release. All the mode keys flash twice. 16 Advanced Features Setup Turning the Keypad Backlighting ON (continued) STEP 2. Enter using the numeric keypad. The AT&T key will give a long flash and a long beep, indicating successful programming. The RF Remote Control then returns to its normal state. D. Home ID Your RF Remote Control and USB Converter were paired at the Factory. In the event you are receiving interference from another RF device, your RF Remote Control and USB Converter allow you to create a new Home ID using any number from 0000 to To change your Home ID: STEP 1. Press and hold the Pairing Button 1 on the USB Converter until the blue Power LED 2 turns off. The USB converter is now ready to be programmed. 17 Advanced Features Setup Home ID (continued) NOTE: The USB converter will remain in programming mode for two minutes to receive the Home ID command from the RF Remote Control. If the blue LED light turns on, it means the USB converter timed out and you must start over. STEP 2. 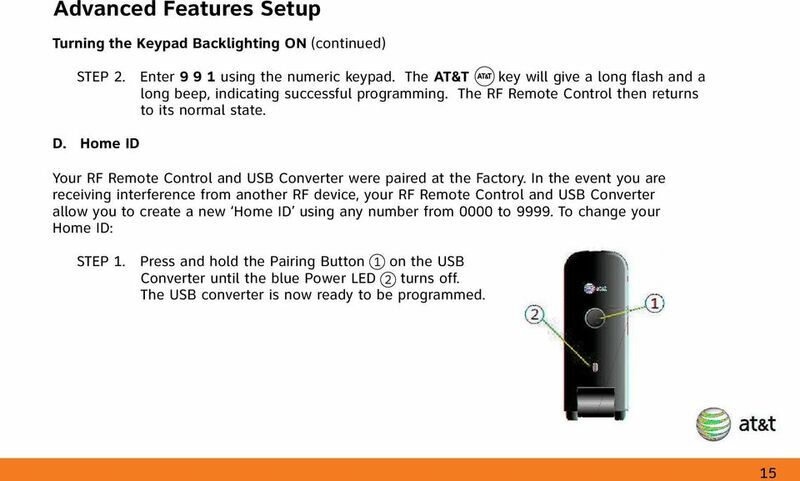 On the RF Remote Control, press and hold both the AT&T and OK keys for one second, then release. All the mode keys flash twice. STEP 3. Enter using the numeric keypad. The AT&T correct entry. key will flash twice indicating STEP 4. Using the numeric keys on the RF Remote Control, enter the Home ID you want to program (any 4 digits using 0-9 such as 1234). STEP 5. 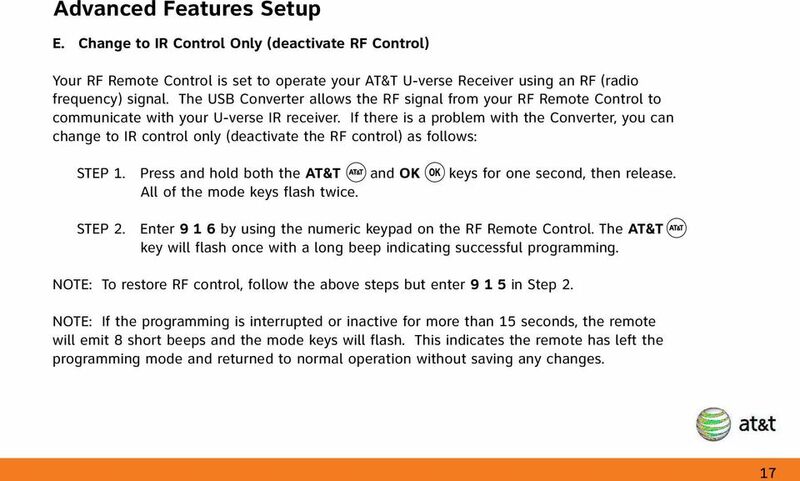 The AT&T key on the RF Remote Control will give a long flash and sound a long beep. At the same time, the blue Power LED on the USB converter will flash for 2 seconds then remain on. This indicates Home ID pairing was successful. 18 Advanced Features Setup E. Change to IR Control Only (deactivate RF Control) Your RF Remote Control is set to operate your AT&T U-verse Receiver using an RF (radio frequency) signal. The USB Converter allows the RF signal from your RF Remote Control to communicate with your U-verse IR receiver. If there is a problem with the Converter, you can change to IR control only (deactivate the RF control) as follows: STEP 1. Press and hold both the AT&T and OK keys for one second, then release. All of the mode keys flash twice. STEP 2. Enter by using the numeric keypad on the RF Remote Control. The AT&T key will flash once with a long beep indicating successful programming. NOTE: To restore RF control, follow the above steps but enter in Step 2. NOTE: If the programming is interrupted or inactive for more than 15 seconds, the remote will emit 8 short beeps and the mode keys will flash. This indicates the remote has left the programming mode and returned to normal operation without saving any changes. 19 Advanced Features Setup F. Restoring Factory Defaults F1. Return all programmed codes to Factory Default (including Learned codes) STEP 1. Press and hold both the AT&T key and OK key for one second, then release. STEP 2. All the mode keys flash twice. STEP 3. Enter using the numeric keypad. 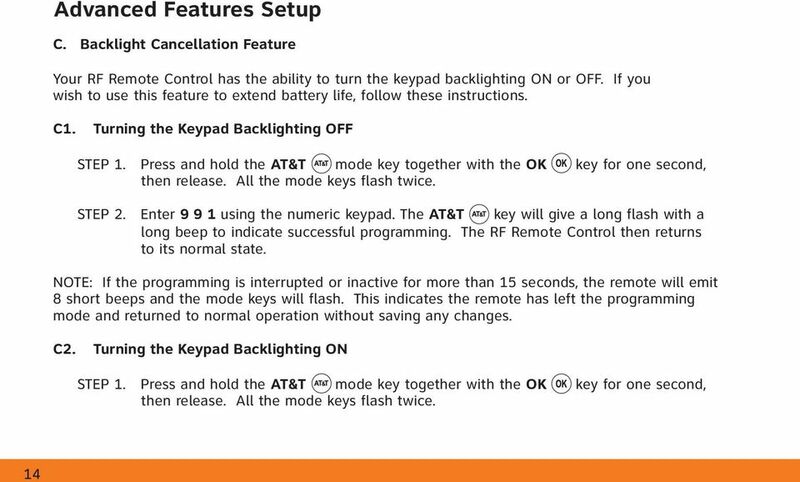 The AT&T key gives a long flash with a long beep to confirm successful programming. The RF Remote Control returns to its normal state. F2. Return Learned codes to Factory Default (does not reset codes programmed through the Search process) STEP 1. Press and hold both the AT&T key and OK key for one second, then release. STEP 2. All the mode keys flash twice. STEP 3. Enter using the numeric keypad. 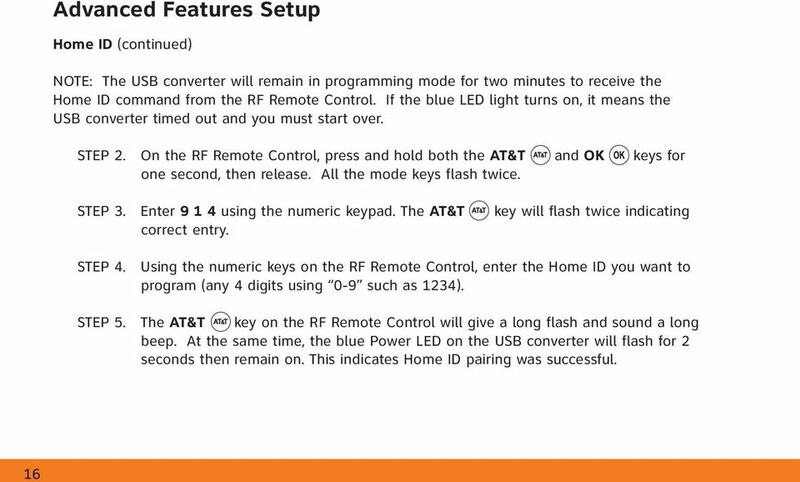 The AT&T key gives a long flash with a long beep to confirm successful programming. The RF Remote Control then returns to its normal state. 20 Troubleshooting Issue: I pulled the tab from the battery compartment and pressed the AT&T key, but it did not light up. Remove the battery door (push the battery door tab up towards the top of the remote). Check to be sure the batteries are seated and properly installed according to the ( + or - ) markings inside the battery compartment. Issue: The remote does not work or the backlighting is dim. Check to be sure the batteries are installed properly (see above). Use only Alkaline batteries. Batteries may be weak and need to be replaced. Issue: My remote control does not control my U-verse receiver; I can t change channels. Make sure the converter is properly installed and the blue LED is lit. Issue: I tried to program using Search for Device Codes, but it failed. You must press the ENTER key to "save" the programmed code. Search doesn t work for all devices, try Learning Device Codes (Page 8). Issue: What should I do when I replace a device after I programmed the mode key? 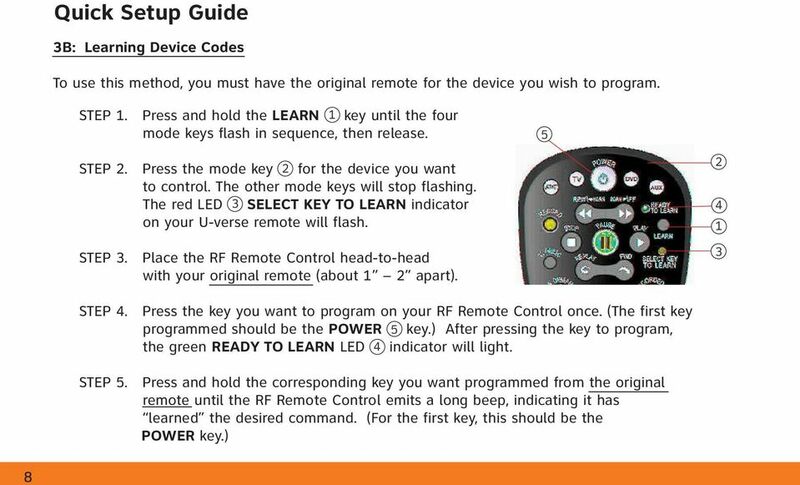 Simply override the code by reprogramming the mode key for the new device (see Quick Start Guide, Section 3A Page 6, or Section 3B, Page 8). 21 Troubleshooting Issue: I have programmed the codes for a device, but some function keys do not work. Try using Search again and make sure that the functions work before saving. If the desired device functions still do not work, refer to the Quick Setup Guide, Section 3B: Learning (Page 8). Issue: I have programmed the TV mode key. 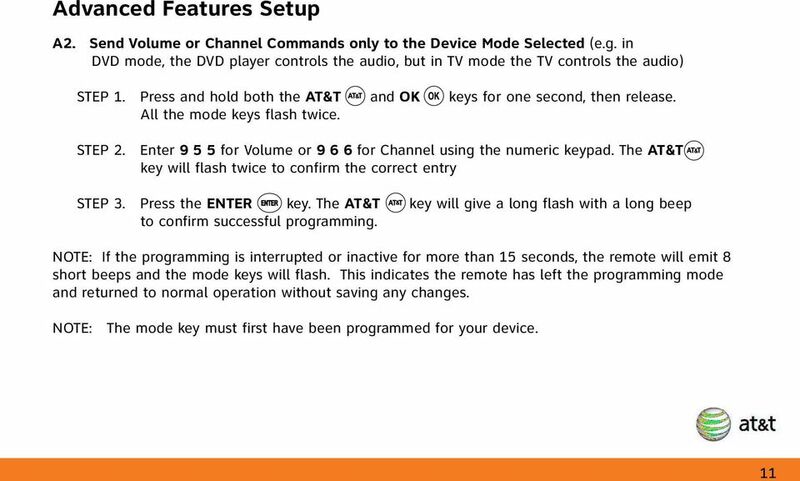 After pressing the TV key, the CHANNEL keys still control the AT&T U-verse Receiver and not the TV. By default, the CHANNEL keys (,, ) on the remote operate the U-verse Receiver. Issue: The volume (or Channel) on my U-verse service changes by itself. To avoid interference from other RF remotes, See Section D: Home ID (Page 15). Issue: I programmed my TV and Home Theater system to come on with my U-Verse Receiver, but the Home Theater system turns off when I turn the others on. If any of the devices get out of sync so that some turn ON while others turn OFF, you will need to turn all devices OFF. (For the device that is out of sync, use the actual device s power button). 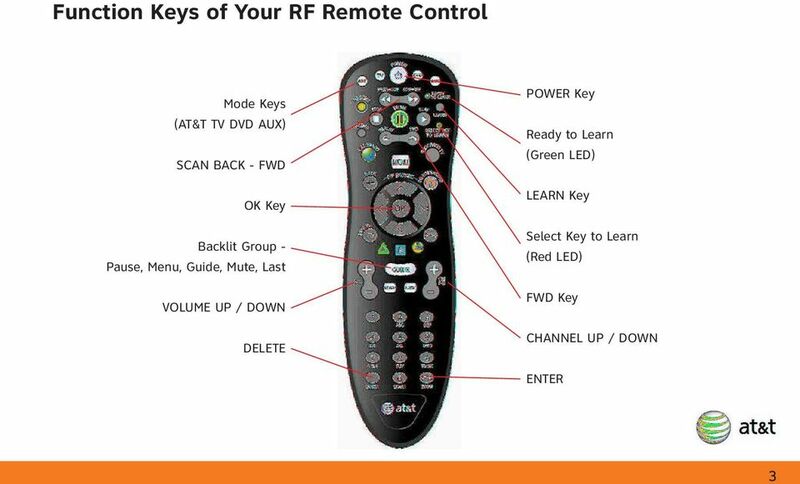 When all devices are OFF, use the POWER key on the RF Remote Control to turn all devices back ON. It is important to point the Remote Control directly toward the devices for this to work properly. 22 Care and Maintenance 1. Keep the remote dry. If it gets wet, wipe it dry immediately. 2. Use and store the remote only in normal temperature environments. 3. Handle the remote gently and carefully. Don t drop it. 4. Wipe the remote with a clean cloth occasionally to keep it looking new. 5. Except for the battery door, do not attempt to open, modify or tamper with the internal components of the RF Remote Control and/or USB Converter. This can cause malfunction and void the warranty. 6. Use only Alkaline AA batteries. Do not mix old and new batteries. Replace batteries every 9 months for optimum performance. 24 FCC Requirements (continued) 1. Reorient or relocate the receiving antenna. 2. Increase the separation between the equipment and receiver. 3. Connect the equipment into an outlet on a circuit different from that to which the receiver is connected. 4. Consult the dealer or an experienced radio / TV technician for help. Warning: Changes or modifications to this unit not expressly approved by the party responsible for compliance could void the user s authority to operate the equipment. 25 Customer Service Information For help with your AT&T U-verse service or this remote control, please visit support, or call AT&T Customer Care at ATT When prompted, say you need U-verse Technical Support. 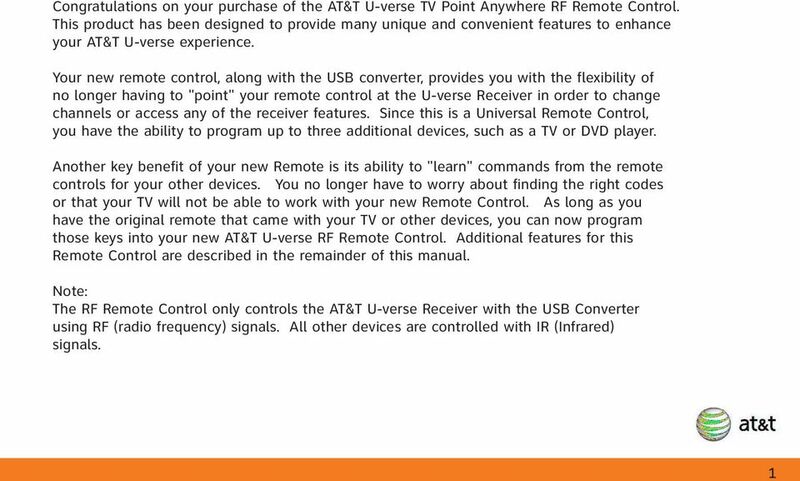 For a Spanish version of this manual visit: One (1) Year Warranty AT&T guarantees from one (1) year of purchase this AT&T U-verse TV Point Anywhere RF Remote Control will properly perform its intended functions. This is a Limited Warranty that does not cover defects resulting from misuse, abuse, accident or negligence, including any failure to follow the instructions provided with the RF Remote Control. Consequential and incidental damages are also not recoverable under this limited warranty, but some states do not allow the exclusion or limitation of incidental or consequential damages, so this limitation may not apply to you. If during the first year after the purchase date and under normal working conditions the RF Remote Control does not perform its intended functions, please call ATT If the RF Remote Control is replaced by AT&T during the first year, the replacement remote is warranted to properly perform its intended functions for either ninety (90) days or the remainder of the remote control s one year warranty from the original date of purchase whichever is longer. To receive a replacement RF Remote Control, you must provide proof of purchase. 26 Specifications and Notice Model: AT&T U-verse TV Point Anywhere RF Remote Control IR Range: up to 30' * RF Range: up to 150' * * The range quoted is calculated based on an unobstructed line of sight test under optimum conditions. Actual range will vary depending on conditions, and can be less than the maximum possible. Your actual range will be limited by several factors including, but not limited to: battery strength, electromagnetic interference, infrared interference, and obstructions. 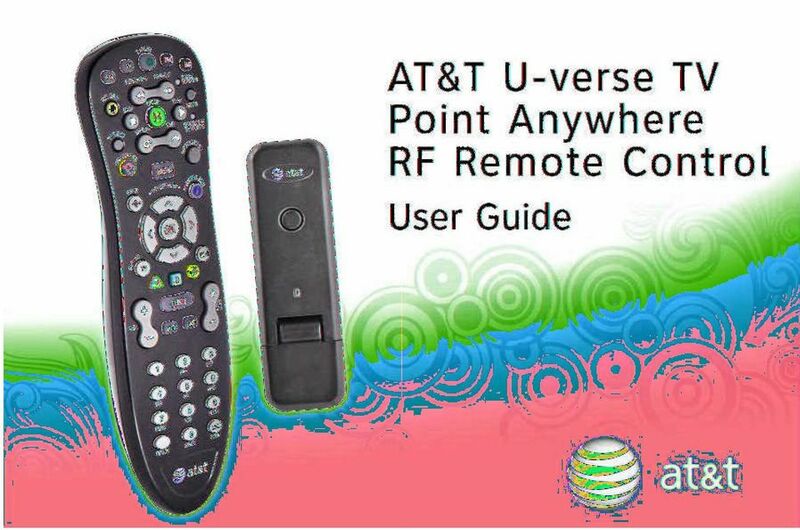 The AT&T U-verse TV Point Anywhere RF Remote Control is intended and sold for use only with AT&T's U-verse TV receivers. May not be compatible with all entertainment systems or capable of accepting every programming code for other devices. Limited one year replacement only warranty. See inside this User Guide for further information. RF5700 Series Wireless Keyboard & Mouse Bundle User s Guide Version 1.0 The information in this document is subject to change without notice and does not represent a commitment on the part of the vendor.